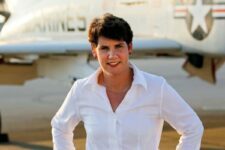 Based on the immediate, widespread national and statewide media coverage, Amy McGrath of Kentucky has had an amazing rollout to her campaign for Congress in Kentucky’s 6th District. CNN, MSNBC, The Washington Post and many local and national news outlets are running her riveting announcement video. Hashtag #AmyMcGrath is trending on Twitter. Watch here: https://www.youtube.com/watch?v=CcjG2fK7kNk#action=share/. Amy McGrath holds the distinction of being one of the country’s first women fighter pilots. With an impressive resume a mile long, McGrath is a Lieutenant Colonel in the United States Marine Corp. (Ret.) and is now turning her sights towards fixing the mess in Washington. 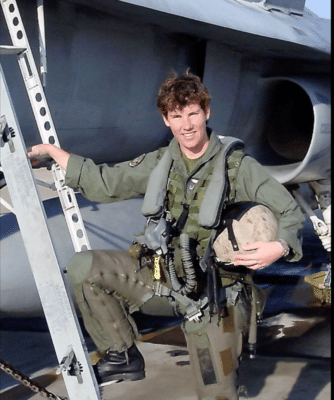 “The decisive style of leadership I learned in the Marines is what I’m prepared to bring to Congress. Our country is in crisis. We need leaders who never flinch,” says McGrath on her campaign website. On the morning of September 11, 2001, Amy spent three hours strapped into an F/A-18 loaded with air-to-air missiles. She was on alert status with all aircraft systems operational next to the Miramar runway, awaiting orders to launch and potentially shoot down any commercial airliner believed headed for a terrorist attack on Los Angeles or San Diego. 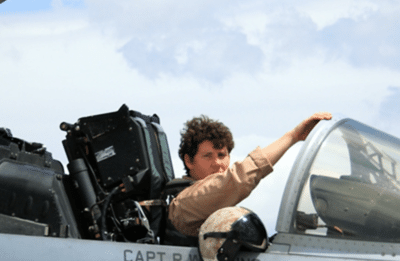 Shortly thereafter, then Captain McGrath, call sign “Krusty”, deployed to Kyrgyzstan in support of Operation Enduring Freedom (OEF) where she flew combat missions in Afghanistan. Following her deployments in the Middle East, McGrath returned to Washington, D.C. and was assigned as a Marine Corps Congressional Fellow, serving as defense and foreign affairs policy advisor to Rep. Susan Davis of San Diego. Following her time on Capitol Hill, she served in the Pentagon as the Marine Corps’ liaison to other federal government agencies such as the Department of State and USAID. In 2014, having reached the rank of Lieutenant Colonel, she was assigned to the faculty at US Naval Academy where she served as a senior political science instructor until her 20-year retirement from the Marines Corps on June 1, 2017. During her senior year at a high ranked all girls Catholic High School, Notre Dame Academy in Park Hills KY, Amy played three varsity sports. When the combat exclusion law was lifted, following the election of President Bill Clinton, and she was accepted into the United States Naval Academy as part of the Class of 1997. She played varsity soccer for Navy all four years, graduated with a B.S. in Political Science, and was commissioned as a Second Lieutenant in the U.S. Marine Corps. After Marine Corps Officer Basic School, Amy completed flight school in July 1999 and reported to Marine Corps Air Station Miramar, San Diego, CA as an F/A-18D Hornet Weapons Systems Officer. Amy holds an M.A. in International/Global Security from The Johns Hopkins University and a Graduate Certificate in Legislative Studies from Georgetown University. She is also a graduate of the Center for the Study of Weapons of Mass Destruction’s Program for Emerging Leaders at the National Defense University, Marine Amphibious Warfare School, Marine Fighter Weapons Division Tactics Course, and Marine Corps Command and Staff College. Amy’s awards include two Meritorious Service Medals, eight Strike Flight Air Medals, Navy/Marine Corps Commendation Medal, Navy Achievement Medal, Presidential Unit Citation, two Afghan and one Iraq Campaign medals. Amy and her husband Erik have three children, Theodore (5), George (3), and Eleanor (1), and live in Georgetown, Kentucky. For more information or to contribute to Amy’s campaign, visit https://www.amymcgrathforcongress.com/.